The Hoover Portapower was built for lightweight surface cleaning and a wide range of detail cleaning jobs. It is a carry on cleaner that packs the power to handle any cleaning tasks thrown at it with ease. It lacks wheels, trading the ‘wheeling’ for flexibility and more directed handling. It comes with a convenient fingertip on/off switch. A bagged design ensures secure dirt and debris storage. A long power cord provides for extensive reach. The shoulder strap and lightweight design provides good maneuverability. A re-usable cloth bag for commercial use and a paper bag option. A comfortable shoulder strap ensures you don’t keep tripping on the vacuum. The cleaner is compact and easy to carry using the shoulder strap, freeing both hands. Measuring in at only 8.3lbs, it is a good option for users who clean regularly. Bulkier vacuums often leave the user fatigued, or with a strained back. Owing to its small build, this vacuum easily cleans surfaces under furniture without requiring them to be moved around. A padded shoulder strap for more carrying comfort is a welcome addition to this cleaner. There is a limit to how far many regular vacuums can go when cleaning up tight spots. Small spaces and inaccessible surfaces are cumbersome to clean sometimes, when your vacuum is not designed to conquer them. With a choice for different heads, this cleaner doesn’t feel like a wrestling match when you want to reach and clean up the tightest of spaces. The Hoover CH30000 Porta Power Lightweight Commercial Canister Vacuum is one of the most versatile vacuums in production. Its portable profile makes it the ideal choice for cleaning a wide range of surfaces. 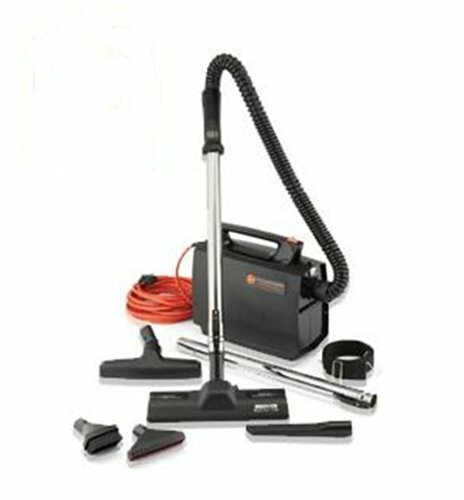 Whether you want to scrap off cobwebs off your walls, dust your car’s interior, spruce up your upholstery, dust your window seals or get rid of fine sawdust from your newly installed cabinets, this vacuum handles it all. It provides excellent cleaning for pet lovers, picking up every strand of cat or dog hair from the surface. Porta Power is a good choice cleaner for expensive wool rugs. It’s gentle and will not pull off nap from them like vacuums with beater bristles. It is especially a perfect vacuum cleaner for hardwoods but will readily take on surfaces like tiles, linoleum, and concrete. The vacuum also couples up as a blower for patios and sidewalks, with the hose attached. This Hoover vacuum is made with a lengthy 33 Ft power cable. It is quite useful for cleaning large areas at once without having to unplug severally. It makes heavy duty cleaning, like working on many rooms at the same time very convenient. With this vacuum, you no longer need to keep plugging and unplugging at every room. Emptying the filter is no easy task sometimes. Getting used to the vacuum cleaner canister may take some time. It offers no storage for its attachments when they are not in use. The power cord lacks a swivel mechanism. It sometimes gets tangled up while working. When the cleaner misses dirt, or requires that you pass it over the surface being cleaned several times before it picks up some stubborn debris, it’s time to check your tool. Here are some maintenance tips to ensure the vacuum cleaner serves you for long. Clean the vacuum filter regularly to avoid dirt clogs. The filter is hand washable. Check the bag and empty it whenever it fills up. It’s a good practice to empty the bag before it gets completely filled up. Check and clean the brushes regularly to get rid of debris like stuck hair. Lubricate and keep the drum roll bearings clean. Keep the hoses free of clogs by blowing and cleaning them up. Remove any large objects that may get lodged in the hoses immediately. Take care of the power cord. Avoid pulling out the vacuum from the plug by the cord. Who should buy this vacuum? It doesn’t matter if you are searching for a vacuum for home use, shop use or a bridal gift; this vacuum easily fits any profile that requires a multi-use, good handling, and lightweight cleaner. It shouldn’t come as a surprise to find decades’ old models of this vacuum still in a usable state. They are made to last, and they rarely disappoint at this if they are well looked after. Finally, hope this Hoover Portapower CH30000 Canister Vacuum Review useful for you.